Summer of Socks Rides Again! 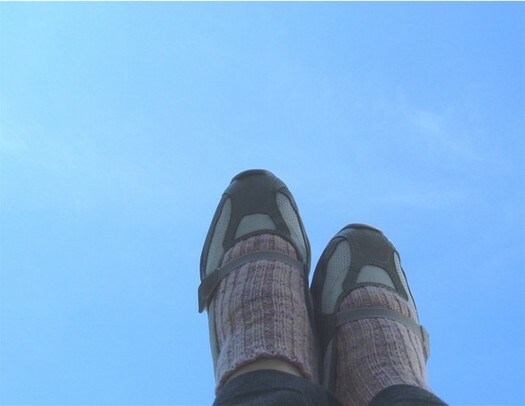 Today, Jessica announced that there will another Summer of Socks happening this year. Follow the link cleverly hidden in the button to go to her blog post that has the link to the sign-up page. This year, Jessica is asking that people who join have blogs and/or have an account at Ravelry and/or Flickr. While not everyone has a blog*, it is easy, fast and free to get an account at Flickr. In fact, it's so easy that I have an account there. You know it has to be easy if I can do it. And, yes, I did join the Most Socks Contest. 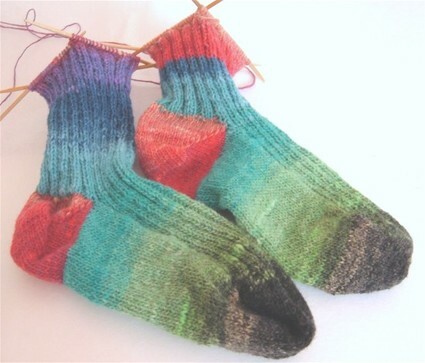 No, I am not putting everything on hold so I can knit socks again this summer. Last summer was plenty, thanks. However, Jessica does need 15 people to join each contest, so it can be activated and this is me trying to help out. Btw, if you notice that the socks are eating my brains (again), be a pal and yell at me, would ya? In email please. The masses don't need to see it here. Yes, the masses being the four people who read my blog. While I can crank out a pair of socks in three days. Ask me what I did last weekend! I really don't want to do that again. Been there, done it. Ya know? So go sign up because Jessica is a fabulous girl. A little on the tall side, but a fabulous girl and the whole knitting socks with people thingy is a lot of fun. Then, go see Nora and wish her happy because today is her birthday and she's also fabulous. Although, I'm not sure how tall she is. * Yes, I'm looking at you, KellyS. I came home yesterday and found a box of swag on my porch. Considering I had almost told off/smacked down a woman at the post office*, it was a lovely surprise. The red tee shirt says 'You look Guilty' on the front and The Closer blah blah on the back. If you're someone I nag in email, you'll know how perfect that tee shirt is for me... once I learn to love the color red. 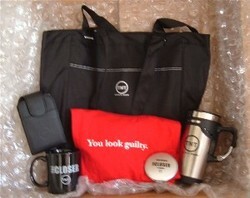 I love the black tote bag. It's going to the grocery with me next trip. It has a very cool black and white lining and my mother perked up when she saw it this morning. She wanted to know if it had a pocket inside. Thankfully, it does not, so I got to keep it. She's always got an eye out for the next huge handbag. She did get the very cool metal and black travel mug, but I'm not a coffee drinker. She didn't understand the whole swag concept and, at my age, I don't have time to explain it to her. I do love the coffee mug, ironically, and plan on using it for juice and what-not. The black case has a little notepad and I think will hold a cell phone. Since my memory is spotty at best, I think I love that idea. The round silver thingy near the travel much is a mirrored compact that takes batteries, so I'm thinking it lights up. It tells you to 'Look Innocent' because The Closer is coming. Now I'm just waiting for my email from Kyra Sedgwick**. * If you cannot chew gum with your mouth closed, perhaps you should not chew gum in public. Better still, perhaps you should not force yourself on an unsuspecting public who merely wants to mail something at the post office. It's a beautiful sunny day here in northern California and I'm heading to enjoy it. Or get lunch. We'll see how things go. I hope you're day is sunny, cloudless and fabulous. With a yarn that does not want to have it's photo taken. 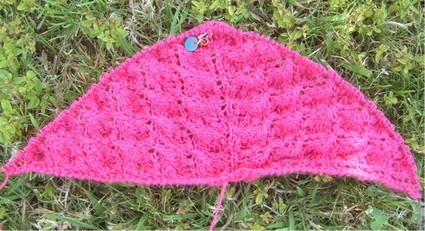 That is five repeats of the Flower Basket Shawl. I'm trying to do a repeat a day. Figuring that I'll have it done sooner rather than later. I did rip the first version of this and restart it. I am making a point of knitting a bit loose for me and it is helping. That garter edge is much nice this time and that makes me happy. Before I had been concerned about how I would block something with such a non-stretchy edge. Not a worry now. Instead I can worry about spit-splicing the skeins together. That should be fun. Oh, and the yarn came from my fabulous April, who really needs to update her blog. While it's not a guava, it is close in color to my yarn and equally unwilling to be photographed. 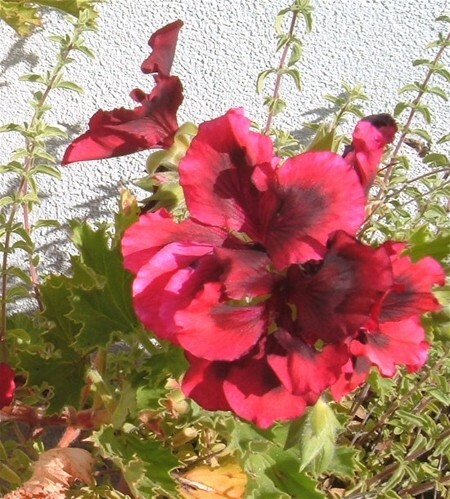 It's some kind of geranium for the curious. J.Knits is the yarn. It came from Stacey. I don't know anything beyond it came from Stacey and it's green. 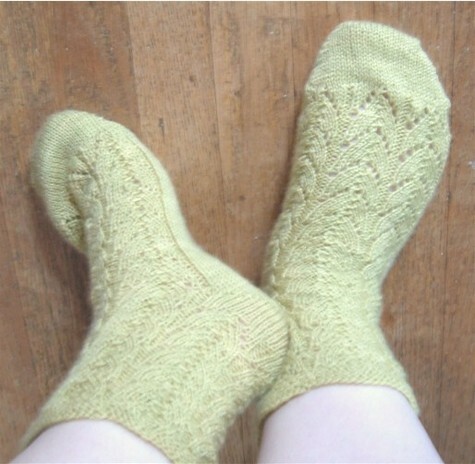 I used my usual 2.75 mm dpns and my beloved short row toes and heels. Life's too short for flaps, people. I knit fewer pattern repeats than the pattern called for on the leg because I was worried they would end up being a weird length. They're still a weird length, but I think it's a better weird. Yes, there is such a thing as "better weird" in my world. It's windy here and I've got fabulous headache/allergy/vision issues, so we're hoping for better photos once these socks arrive in their new home. Keep your needles crossed, people. I did take photos of the Flower Basket Shawl in progress with the cat. She was awake, had her eyes open and everything. However, because of the above, the photos were crap and I'll be trying again tomorrow with the lace somewhere outside. The cat doesn't go outside, so she won't be modeling this time. Yes, I know. I'm worthless this time of year due to allergies and more seasonal weirdness than normal. It's always been this way. I try not to think about whether that makes it better or worse. Some things should not be pondered. One of these socks isn't like the other. One of these socks just doesn't belong. Yes, it's the return of the Noro socks. As you can see there is a slight difference in the flow of colors. A difference that I think I can fix. I hope I can fix it because the first sock (on the right) is just wrong. It's swimming upstream or something. Against the natural pattern of things. My plan is to rip back the red on the first sock, splice in more blue and carry on. I'm not 100% sure it will work, but it's worth a go. Plus I'll need something to keep my mind busy now that Ozzy has been voted off the island. I know he was all ego all the time, but he's also pretty and, on knitting/Thursday nights, that's okay.